RAPAPORT... Civil-society groups have lashed out at the lack of transparency in the diamond industry, claiming the trade continues to be linked to human-rights abuses, conflict finance and corruption. 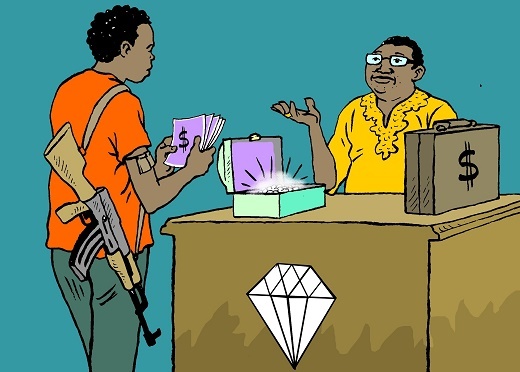 “Although the diamond industry is not the only sector facing these threats, it is unique in its particular unwillingness and inability to take genuine steps towards responsible business conduct,” read a statement published by Amnesty International, The Enough Project, Global Witness, Human Rights Watch and Impact. The Kimberley Process (KP) readmitted CAR in 2016, after the country’s membership was suspended in 2013 due to the conflict. The KP allowed supervised exports of rough diamonds from certain compliant regions in the country, with a two-week clearance deadline that was shortened to one week during the KP intersessional meeting this past June. The NGOs also pressed for meaningful reforms at the KP, noting that the current agenda was almost identical to the one forwarded five years ago. They further charged that transparency had been clouded by a push toward confidentiality at the KP. “That is not the sign of an initiative moving forward or bringing meaningful progress on the ground,” stressed the groups, many of which pulled out of the KP in recent years. Given these failures of the KP, the civil-society groups urged the diamond sector to strengthen its participation in other responsible-sourcing forums. They called on the trade to adopt practices aligned with the Organisation for Economic Co-operation and Development (OECD) Due Diligence Guidance for Responsible Supply Chains of Minerals from Conflict-Affected and High-Risk Areas, as well as the UN Guiding Principles on Business and Human Rights. Meanwhile, the groups expressed concern that efforts by individual companies to advance responsible sourcing lacked serious engagement. Too often, corporations set their own agendas for what responsibility means and don’t allow for the transmission of source-of-origin information through the supply chain, they explained. Furthermore, companies prevent stakeholders from assessing their programs against transparent standards, the groups charged. The statement also called for companies to do more to tackle human-rights abuses associated with large-scale mining and to develop sources from artisanal miners that can enable sustainable development and positively impact the livelihoods of their communities. “Both the diamond industry and the international community should be extremely concerned that links between diamonds, human-rights abuse, conflict and corruption remain a reality and that current measures are failing to adequately address this unacceptable situation,” the civil-society groups said.